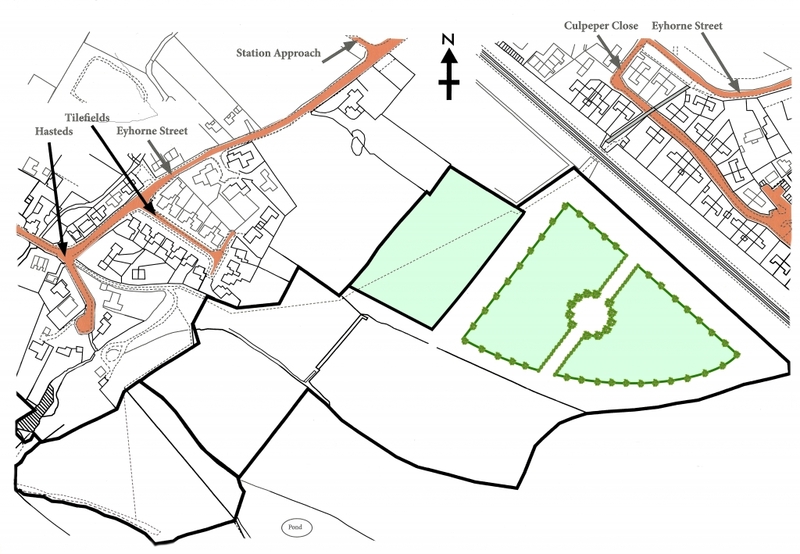 HMTL are working in partnership with the Leeds Hollingbourne and District Branch of the Royal British Legion, to plant an “Avenue of Remembrance”, with 100 trees to mark the 100th anniversary of the end of WW1. We are looking to raise more than £250,000 in donations from both public and commercial entities. After the initial cost of the project is covered, all surplus funds will be evenly divided between the two charities. The ultimate goal is to raise at least £100,000, (representing £1000 per year), for the LH&DB of the RBL. They will in turn discharge these funds into the appropriate approved Royal British Legion charities funds and causes. 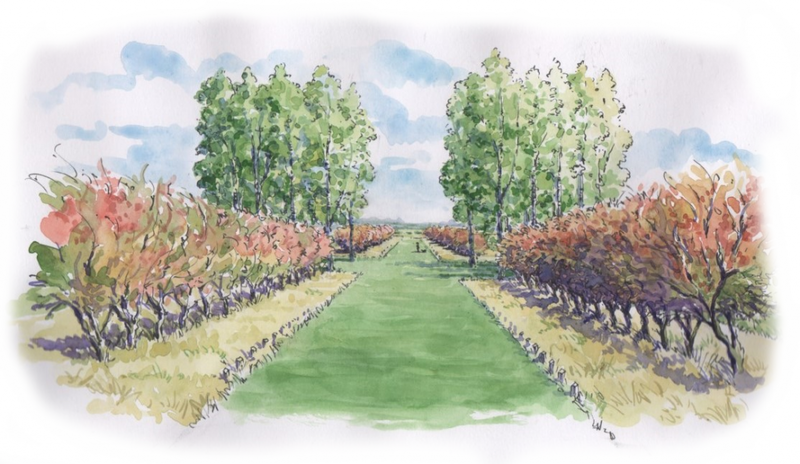 The trees will be planted in 4 lines of 25, with a “Circle of Peace” in the middle of the Avenue. The Hawthorn tree was chosen from a long list of trees native to the Kent country side as it best embodies and personifies the soldier and comrades that so valiantly marched into battle to defend our liberties. HMTL Ranger, Benedict Williams, took inspiration from the tree’s symbolisation: “The red berries for the blood, the white flowers for the peace, gnarled trunks look similar to the stumps left after the shelling. They start as saplings and then grow and come together, it is like the naive young men from across the country who came together, as they grew in stature, confidence and camaraderie to prevail”. In the event that sufficient funds are not generated for the project as described, we will scale down our commemorative memorial to a cost not exceeding funds raised. Project 100 is looking for everyone who feels that they want to be a part of this project to make a small (or larger) donation towards it. As we are looking to crowd fund this Project, if we can get at least £2 from every person whose social media platform this comes across, then we will successfully be able to achieve all our goals and build this beautiful Avenue of Remembrance for all too freely enjoy. We are also looking for businesses, commercial entities and companies to get behind the project and support it in any way that they can. We have a larger commercial sponsorship/donation acknowledgement package available for those companies who would like to be part of this endeavour. Please get in touch directly with HMTL for more details. Thank you for giving generously and please follow and share our social media updates and to view the project progress. We are also looking for volunteers to help with the project, so if you feel you can help in anyway, please get in touch, all help greatly appreciated. ► If your donation is in the form of a cheque (Payable to "The Hollingbourne Meadows Trust Ltd") or cash, these can be sent or handed in at: Autumn Cottage, Musket Lane, Hollingbourne, Kent ME17 1UY. 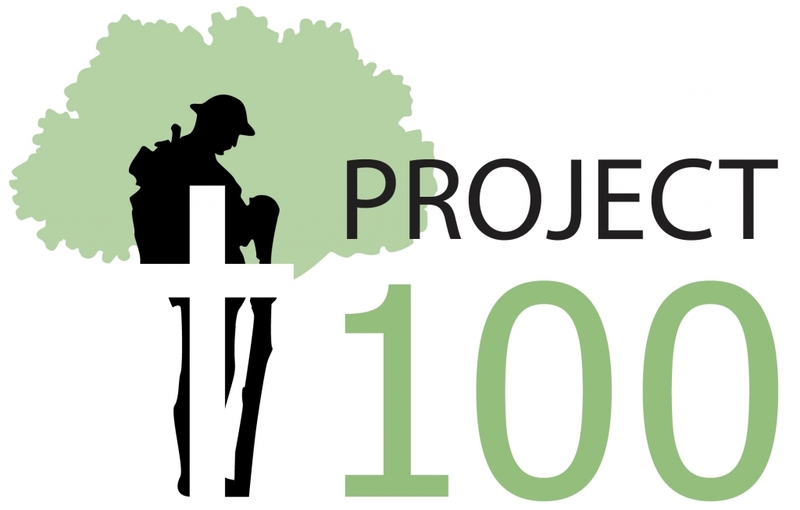 Please mark your donation for Project 100. When donating, please consider using Gift Aid. For every £1 you donate, the taxman gives us 25p (at no cost to you). The Hour is here, as the deathly days break into dawn. Oh Hawthorn come, Oh come brave young Hawthorn. Come face our fears and all that may befalls. Look to the left and right, do not count the souls. Be courageous, be strong, stand tall young tree, stand tall and be brave. The rain lashes your cold skin, wave after wave. You stand alone at first and face the storm. So do your young branches begin to with each others entwined. Let us look back and know the peace for which you fought and paid its worth. Your hardy courage rooted firmly in your hole. May God bless and keep eternal your soul. Let us stand before you now and repose in your harmony. Thank you mighty Hawthorn for this country today that is mine. Let us stand today and blow the trumpet, let us blow the horn. 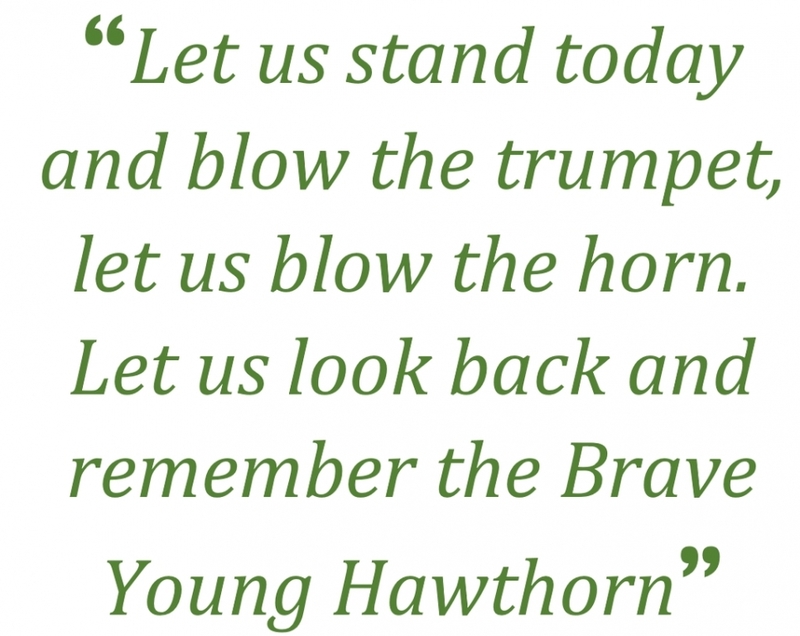 Let us look back and remember the Brave Young Hawthorn.